17°C, milky sun and no wind. Started out on the Jake with the commuting wheels fitted. They have Schwalbe Durano tyres for the fast but puncture resistance. Less than a mile out a sharp high pop rang out. Instantly the front tyre was flat as I made a right-turn on a busy A road. Rather than fix it there, I walked back to get the other bike. Part of the tube is actually missing. 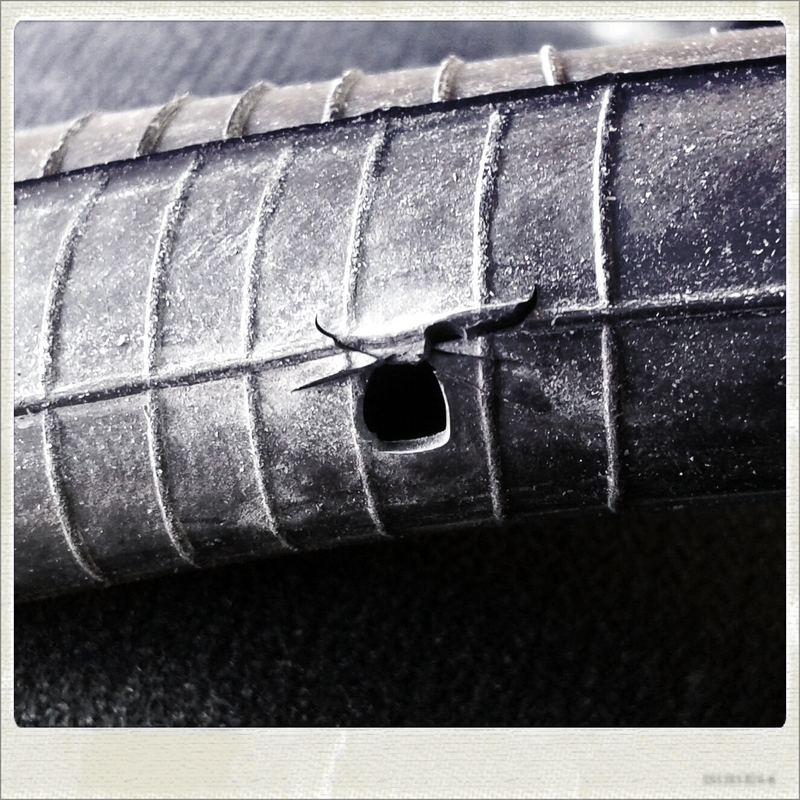 Looks to me like the tube was pinched inside the rim and chose a bad moment to burst. I rode fixed with MapMyRide+! Distance: 36.04mi, time: 02:15:09, pace: 3:45min/mi, speed: 16.00mi/h. Plan B, grab the fixed bike, the Paddy Wagon and rode the same route. For only the second time this year I got up Bannister Hill. This time was on the higher 42×16 gear. No serious struggle today. Those wheels are brilliant. So fast and nimble. later: it turns out that the climb up Bannister Hill was my personal record 9′.08″. This entry was posted in Cycling, fixed gear and tagged Bannister Hill climb, Cycling, fixed gear, puncture, sunny spring. Bookmark the permalink.